Terry Pratchett is one of my favourite authors. I prefer his science fiction to his fantasy, but the Discworld is what he's best known for. As they said on one of his books' covers, there are 8 million books by Terry Pratchett in print. You don't have to read them all; just one of each. I suspect Pratchett doesn't set out to write satire, just a good story. Which is just as well, as satire works better when it's subliminal and a critical reviewer has to dig to expose the fossilised remains and dance around pointing out the faint imprints of the tail feathers. And he felt happy. Thief-taker, Rust had called him. The man had meant it as an insult, but it'd do. Theft was the only crime, whether the loot was gold, innocence, land or life. That is a line that changes paradigms, doesn't it? This is the kind of stuff that keeps me coming back for more. (One of these weeks I'll give you a matching one from Jack Vance). Night poured over the desert. It came suddenly, in purple. In the clear air, the stars drilled down out of the sky, reminding any thoughtful watcher that it is in the deserts and high places that religions are generated. When men see nothing but bottomless infinity over their heads they have always had a driving and desperate urge to find someone to put in the way. Basically, in Jingo you see how jingoism is whipped up out of thin air, and how military nincompoops take over against all common sense. If thieves (in the sense above) can be caught and sentenced for all other crimes, why cannot they be caught and sentenced for taking countries to war and getting (mainly young) people killed for no really good reason? If declaring war was treated as mass murder, and those who did it faced the same kind of trial as those who are sentenced as such, we would have fewer wars. In the real world, though, those who declare wars almost always win the next election. Good enough reason to never vote for them again, I say, not to vote them in. This is a funny book, like all Discworld books, but, in this sense, one of the most depressing, when you come out of it and back to reality. Read it. Read it. As the cover says, Yet Another Novel of the Discworld. You really don't need any other recommendation. Science fiction | Vernor Vinge. Thanks to Glenn Costello (many thanks! ), I correct an error in the last few posts. It turns out that my favourite in the series, A Fire Upon the Deep, Children of the Sky, and A Deepness in the Sky, which is Deepness, was actually written last, and is a prequel. The other books are not, as I thought, sequels. So read them in the order above, and you'll be happier. Vinge's writing in Deepness is an order of magnitude tauter than in the previous books. I liked them in this order: Deepness best, followed by Fire and last, Children. Strangely enough, that's the order I read them in, too. But that's just coincidence. A thought now strikes me: I guess we may, after all, find out what happened to Sherkaner Underhill. So I finally finished Children of the Sky. Indeed, once I started on it again, it was unputdownable. This is the follow up story to A Fire on the Deep, which is a sequel itself to A Deepness in the Sky. The last two books in the series could well have been published as one book, since the events follow so closely and the characters are shared between the books (except the ones that got killed in Fire, but Vinge is no George RR Martin, thank goodness, and is thrifty with the deaths). One major difference between these two is that the villains this time include humans as well (oh! the horror!). Ravna revives the surviving children from the cold sleep boxes, and they all grow up into young adults, with no real adult supervision along the way, given how much time Ravna spends on frantically preparing to confront the Blight. And if you've read Lord of the Flies, you know what's going to happen then. Well, not really, the Tines do a good job of adult supervision, for what it's worth. In the meantime, one of the old villains steals a dataset and ties up with a Tine in another country, a brilliant inventor, if somewhat erratic. This villain continues with worse villainy in this episode. Ravna faces slow technology, slow progress, fast talking villains, perfidy and kidnapping. On the plus side are her loyal friends (though one is getting paranoid) and, well, loyal frenemies. Good guys turn out to be bad guys and vice versa. The children are led astray by smooth villains who object to the available technology not being used for things they were used to in the high-tech Beyond. Complete First World Problems complaints! You want to shake sense into them. But are they wrong in their worries? Good eventually triumphs, as in all Vinge's books, but, as usual, only squeaking through in the very last hour. (Hmph, in Deepness, they did their squeaking through in the last few pages-- we were down to single digit numbers of pages by the time the villains were vanquished-- so either Vinge is getting slow in his older age, or this story is not supposed to be as tense a read). I dunno, you may cavil, but I liked Deepness best and I still wonder what Sherkaner Underhill got up to. There is, however, a possibility that there will be another sequel coming up. Ravna has yet to take on the Blight. On the other hand, even a major talent like Vinge may quail at taking on that encounter. He needs to exercise, eat protein-rich diets, fish oil, yoga and things before sitting down and cracking his knuckles for that one. The Blight is a Metavillain. 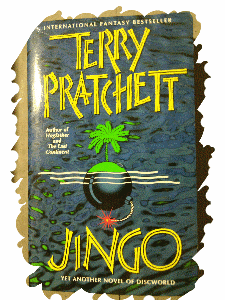 Next up, I will be covering my re-read of Terry Pratchett's Jingo. Like I mentioned in the last post, this book had me helplessly glued to it, and this is when it was a re-read, and also I'd had no intentions of re-reading the whole thing when I innocently picked it off the shelf to read a few pages. And this is Neal Asher's first novel. Whuff. Gridlinked is the story of the fabulous Ian Cormac, described at one point in the book as 'the invention of fabulists', an agent for Earth Security in a universe where people travel from planet to planet via runcibles (Asher's name for the instant-elsewhere device variously called a gate, portal, etc in other fiction of the ilk). People live lives of luxury, mostly, and the tech is way up in the realms of magic. The only thing you cannot carry through a runcible is a proscribed weapon. And yet, there are those who want to leave the Polity, and drag their planet away from it. Separatists, particularly nasty multiple murderers get Cormac's goat, and he's awfully good at getting them to justice. Early in the story, Cormac blows his cover by being too cyborg-like as a result of 30 years of being fully gridlinked with the AIs that run the cities, the runcibles, and Earth Security. Horace Blegg, the near-mythical head of ES, a 400 year old survivor of Hiroshima, suggests that he should get off the grid and take on a new assignment, to find out what caused one of the runcibles to fail, converting an incoming human into a 30 megaton bomb. In this book, you meet the villainous separatist, Arian Pelter, who is as vicious a psychopath as you will ever meet in fiction; his sidekick, John Stanton, a boosted mercenary who prides himself on leaving separatist cells before they go fully bad, and misses the signs this time; Mr Crane, the broken Golem run by Pelter, and other assorted human villains. You also meet the dracomen, who may be alive, or not, probably created by Dragon, a series of four kilometer-diameter spheres with a touchy personality and an inexhaustible supply of lies and indirection. On Cormac's side, there are a team of four Sparkind, two of which are Golems, another Golem, a runcible expert, and assorted AIs and soldiers. Not to forget, the not-paranoid-enough smuggler captain, catadapt women and ophiadapt men. The augmentations that people do are satisfyingly futuristic, the different planets reminiscent of science fiction book covers down the ages. The spacecraft are marvels, the cars fly on anti-gravity, weird killer bugs and robotic spiders populate the shade under strange trees, and the weaponry is enough to start a movie series in itself. He stretched himself out and was wondering if he would get any sleep, when sleep crept up and got him instead. A whodunit with plenty of twists and turns, and a surprise ending. And now, I wonder if a writer has to be ruthless with the characters, not just in setting up challenges for them, but even unto knocking them off when least expected, to get that extra 'grittiness' into fiction. You cannot be empathetic with your characters and create dyed-in-the-wool villains unless you are either psychopathic or have a ruthless grip on your imagination. At one extreme is I-will-gross-you-out-if-I-can't-horrify-you Stephen King and George RR Martin, who is inventively torturous with his characters. Certainly, these writers understand their characters, but they don't care for them, or they would not kill them so gruesomely. The taste has bitter notes all along, and sometimes strongly in the aftertaste, too. Even the chocolate in these is bitter choc. On the other end, you have Anne McCaffery, Catrina Taylor and Gord McLeod, who care deeply for their characters, and shy away from the real gore. There are tragedies and triumphs, but the overall taste is sweet. The villains are misguided and can be brought around, the aliens are understandable, and all problems can be solved if we all pull together. I know which world I'd prefer to live in, all right! And who doesn't like cake? Yet, once in a while, your reading will go for the stronger and less expected tastes. Gridlinked is salty, pungent, with a hint of sour and an early overlay of bitter. More like eating a large burger with chilli than a bowl of chips. Satisfying. 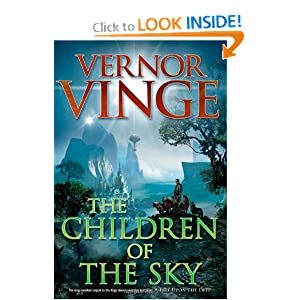 I must confess, I was greatly excited to find that Vinge had written not one, but two, sequels to A Deepness in the Sky. I really wanted to know what happened to Sherkaner Underhill and the rest of the supersmart aliens who found humans cute. Well, I never did. The sequel, A Fire Upon the Deep, takes on the iconic Pham Nuwen part 2. You know, I know, everyone who read the first book knows, that Pham Nuwen was a legend. A solver of impossible problems (not really, but it will be a spoiler for Deepness if I tell you more). He's back, after several thousand years of being left for dead. But let's back up a bit. Fire begins with humans well settled in the outer reaches of the galaxy. For unspecified reasons, Vinge decided that going to the centre of the galaxy to find higher technical civilisations wouldn't work. As you get deeper in the gravity well, therefore, tech slows down, sapients become stupider, things go bad. As you move out, though, things speed up, magic becomes possible: antigravity, FTL travel, transcendent intelligences, the works. Every species' goal, then, is to investigate every possibility of becoming transcendent itself. With help and shortcuts from older transcendent Powers, if possible. However, they know from the gww (galaxy wide web, ha ha, not that Vinge calls it anything but the Net of a Million Lies), that the process of waking up old archives is fraught with danger, and carefully locate High Lab far away from civilisation. Except they make the mistake of bringing their kids along. Anyhow, low bandwidth communication between species (I suppose in the early days of the Net, a speed of several kbps was considered to be really cutting edge futuristic) tracks the progress of the new transcendent, which turns out to be an ancient evil that ensnares all the humans on High Lab, except the kids, which the Countermeasure helps two adults to save in coldsleep boxes, and transport at great risk to a world in the Slow Zone, where they hope to set up a signal and call for help. But there are native intelligences on the planet, some things which are a bit like large, dog-sized long-necked ratlike creatures, which, we slowly realise, are made up of packs. Individuals have no intelligence; only a pack of several individuals is intelligent, but too many together, and the 'mind-noise' destroys intelligence again. Vinge is good at inventing aliens. These critters are at a medieval history level, and some of them attack the ship, kill the adults and several children. 8 year old Jefri and his 13 year old sister Johanna, who dubs them Tines, become the surviving pawns in the low-level power play. In the meantime, in the high-level power play, Ravna Bergnsdot, the lone human in the internet hub called Relay, is approached for help in understanding a human found in a really ancient dead ship, who is found to be revivable after all, and like no modern human. Pham Nuwen is back. Or is he? You know, I know, that Pham is real. But does Ravna, and more to the point, does Pham? How the super evil, the Blight, then attacks, and how Pham and Ravna race to save the children as well as the galaxy, is the rest of the book. There are a few more aliens to meet on the way, don't worry. Vinge specialises in the known evil plot and the unknown villain. You see this first in Grimm's World, the first part of which I read way back soon after it was first published (Eeee, I just dated myself!) and then again in Deepness, which was one suspenseful book, and you see it again in the maneouvering of the tines. Now, I shall proceed with the third book in the series, which, as you already know, I made the mistake of reading 11 chapters of, before realising I was building up spoilers and reading out of sequence. Sigh. No, actually, I will finish rereading Neal Asher's Gridlinked, which I stretched out a hand and picked up to read a couple of pages of, in a free moment, and which I then compulsively started from the beginning and am reading through to the end in a helpless fashion. Then I will get back to The Children of the Deep, which I left at another unexpected-villains-start-winning point, always a depressing stage in any book, and particularly with a master like Vinge. When I review Gridlinked, I will muse about ruthlessness in writers, and whether it is a good thing or not, with side comments on George RR Martin. On the minus side, I never did get to know what happened to the inimitable Sherkaner Underhill and his lovely family. Wail. Here are the promised mutterings about the Robin Cook bestseller. I reread Fatal Cure a few weeks ago. It was a very fast re-read, while searching for the other book I was reading then (which was finally found under a sofa cushion). I'd planned to look up just a few pages, but ended up reading almost the whole book again. Sigh. I should be less easily distracted, but it's not my fault. Robin Cook sprang upon our attention in the 70s, coming up with one best-seller after another. Mostly, the protagonist of the books was a young woman doctor, facing some or the other prejudice (sometimes, extreme prejudice!) and a mystery. There would be some life-or-death situation, medicine, more medicine, friends, supporters, evil villains, you name it, basically the paradigmatic medical thriller. As a result, I was firmly convinced the writer was a woman, and poutily refused to believe that he was, in fact, a man after all. And, despite the change in technologies and many more writers entering this field, Robin Cook remained a name to conjure with. Now, looking back with a more jaundiced eye, I feel the characters in the books were less solid than I'd originally thought, and the writing was more simplistic than simple. Or maybe the editors felt less confident in tackling a Big Name author as the bestsellers piled up. Part of Sam's good fortune had always been his health, yet at half past four on February seventeenth, something strange began to happen. Numerous water molecules within many of his cells began to split apart into two fragments: a relatively inoffensive hydrogen atom and a highly reactive, viciously destructive hydroxyl free radical. As these molecular events transpired, Sam's cellular defenses were activated. But on this particular day those defenses against free radicals were quickly exhausted; even the antioxidant vitamins E, C, and beta carotene which he diligently took each day could not stem the sudden, overwhelming tide. That's actually the key to the whole mystery. If you know what the diagnosis is, you can work out the who, why, and how of the rest of the story as the rest of the clues come up. But you can't, can you? Even if you are a doctor. Robin Cook specialises in the obscure medical fact and the complex interconnections of hospitals and doctors and the entire ecosystem. You think it's a spoiler? Hey, it's paragraphs 3 and 4 of the whole book! Blame Cook, not me. So, you have new doctors Angela and David Wilson joining a town hospital after getting sick of the big city. (This part is very reminiscent of Grisham's The Firm in how the new recruits are wooed). Their paradise gets its first jolt when a missing man turns up dead and buried in their new house. Then David's patients start dying despite all his very best efforts, just like those of his suicide predecessor. And Angela's boss starts harassing her. The more they probe, the more the locals close ranks against them. To be honest, the story is better than I'm letting on, and the writing is, well, Robin Cook. An easy read for a lazy Sunday or two. If you like medical thrillers, this is a shoo-in.